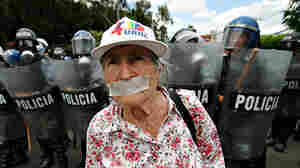 October 26, 2009  The political crisis in the central American nation of Honduras is affecting the entire region. Most international aid to Honduras has been suspended and the country's borders have been intermittently shut since the June coup. Officials who work with migrants in southern Mexico say the turmoil is pushing more and more Hondurans to emigrate. October 24, 2009  Despite the economic downturn and diminishing job opportunities in the United States, impoverished people from around the globe continue to try to make the trek here. One man on Mexico's southern border has spent two years moving from his home country, the African nation of Eritrea, to the edge of Mexico. His ultimate goal? Washington, D.C.
October 16, 2009  Prized for their meat, shells, skins and eggs, Olive Ridley turtles were harvested to the brink of extinction in Mexico during the 1970s and '80s. 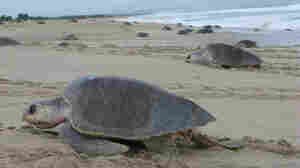 But thanks to a government ban on their slaughter, about 1 million of the sea turtles now nest on three beaches in Oaxaca. Mexico's President Seizes State-Run Electric Co.
October 13, 2009  Mexican President Felipe Calderon has seized the state-run electricity company in the capital and fired some 50,000 unionized workers. Calderon says the utility was inefficient and corrupt, and a drain on the national treasury. Labor leaders say he's playing with fire. October 5, 2009  In Honduras, a protracted presidential standoff is highlighting the deep divisions in the country's society. Supporters say deposed President Manuel Zelaya is being punished for snubbing the elite and championing the poor; critics say he acted unconstitutionally. October 1, 2009  The Mexican government's war against drug cartels over the past three years has claimed more than 11,000 lives, snared thousands of alleged criminals and brought down scores of politicians. One of the newer cartels being pursued by President Felipe Calderon's administration is La Familia, a group that mixes politics, spiritualism and violence. September 28, 2009  Honduras' acting government raided two media outlets loyal to ousted President Manuel Zelaya hours after issuing an emergency decree allowing authorities to close media deemed a threat. It is the latest development in the political saga pitting Zelaya, who sneaked back into the country three months after being ousted at gunpoint, and de facto President Roberto Micheletti. September 28, 2009  There's been a crackdown on civil rights in Honduras, following calls for a revolution by ousted President Manuel Zelaya. The government order will let authorities arrest people without warrants and ban any "unauthorized" public meetings. Zelaya was ousted by the military in June. He has since returned to Honduras but is holed up at the Brazilian embassy. September 24, 2009  Thousands of protesters took to the streets Thursday in the Honduran capital of Tegucigalpa to hold demonstrations in support of the two men who have laid claim to the nation's presidency. September 23, 2009  Brazil's government has asked the U.N. Security Council to convene an emergency meeting to take up the crisis in Honduras. Deposed Honduran President Manuel Zelaya has taken refuge in Brazil's embassy. 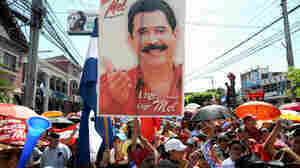 Zelaya was ousted in a June coup but slipped back into Honduras on Monday. His return ignited street battles in the capital Tegucigalpa and a curfew was imposed. September 21, 2009  Deposed Honduran President Manuel Zelaya made a dramatic return Monday to the country's capital. 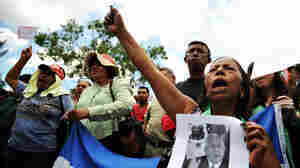 Zelaya took shelter from arrest at Brazil's embassy, and called for talks with the leaders who ousted him from power. Zelaya was flown out of the country on June 28. September 16, 2009  Honduras continues to rebuff international demands that it reinstate deposed President Manuel Zelaya, who was ousted in a coup in June. The impoverished nation was already hard hit by the global financial crisis. Now, it's also losing hundreds of millions of dollars in foreign aid. September 10, 2009  In the Mexican border city of Juarez, drug rehabilitation centers are under attack — with five mass shootings in the past year. 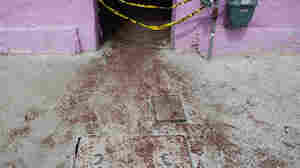 The massacres have prompted more than a dozen facilities to shut down, and some residents worry drug addicts won't get help. September 4, 2009  August was the deadliest month for Juarez, which is often referred to as the murder capital of Mexico. The city is just across the Rio Grande from El Paso, Texas. In one 48-hour stretch, 37 people were gunned down in Juarez, including 18 at a drug rehabilitation center. September 3, 2009  August has been the deadliest month in Juarez, Mexico, since President Felipe Calderon opened the war on narcotraffickers. By some counts, as many as 326 people were killed in August. In his state of the union address, Calderon said he was committed to continue the fight, but it's unclear what else he can add to his arsenal.